Feb 11 - “St. Abigail” © icon by Joan Cole. 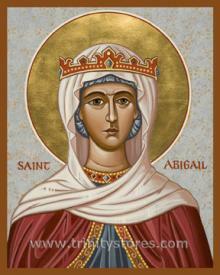 Happy Feast Day St. Abigail! Abigail set off in search for the deer throughout the southern coastal counties. Her journey is now marked by churches and holy wells which are dedicated to her along the way. She finally found the herd of deer in Ballyvourney, County Cork, now known as St. Gobnet's Wood. Abigail would spend the rest of her earthly life dedicated to pastoral service and Christian charitable work. Her brother, St. Abban is believed to have joined her to help set the foundation for a convent, placing Abigail as its abbess, or mother superior of the community of women religious. Abigail also went on to spend much of her time caring for the sick.